3 Bed, 3 Bath Condo On 5th Ave! Wifi, Pool, Gym, Parking, 2 Blocks To The Beach! 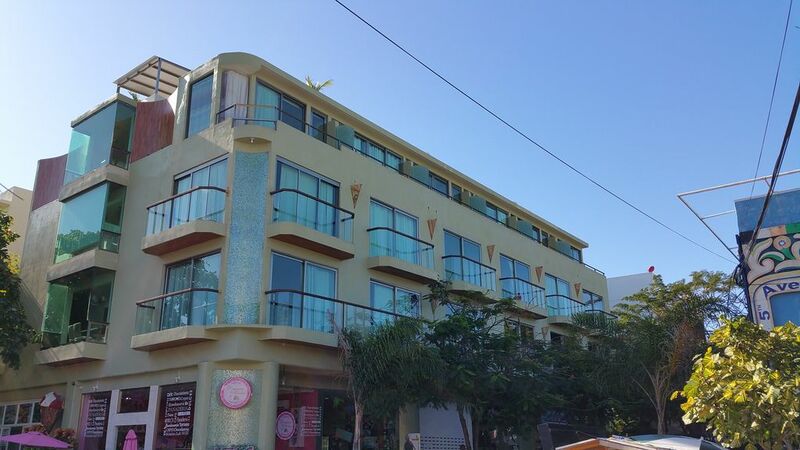 Mimosa is located on 5th Avenue and 38th Street, the most desirable location in Playa Del Carmen. Just 200 meters from the white and powdery sand of Playa Del Carmen beach, Shangri La, one of Playa’s best beaches. In the heart of 5th Ave all the best restaurants are right outside the door. There is a pool, balcony overlooking 5th Ave, Secured underground parking, fully equipped kitchen with fridge, stove, oven, microwave and dishwasher. There is wifi and cable T.V. I'm a Canadian that married an American and moved to Mexico. I love to ride motorcycles and mountain bikes. I also enjoy doing jiu jitsu, snowboarding and working out. In 2016 I moved to mexico to spend more time doing 4 out of 5 of my favorite things. Location, location, location! This spacious 3 bedroom, 3 bathroom condo is located on the famous corner of 5th Ave and 38th Street. Walk to restaurants, shopping, the beach and so much more! The beach is an easy 4 min walk down 38th! Condo has wifi, a pool and secured parking. Located right on 5th Ave! 4 min walk to the beach! Jaret our host was super helpful and open to answering any questions we had. He even arranged transportation for us from the airport to the condo which was spectacular. We had condo(s) 13 and 13A. Condo 13 has two bedrooms and two bathrooms. A kitchen and a living room. Bedroom #1: This bedroom has a bunk bed with a full sized bed on the bottom and a twin bed up top. I have to say, the room is tight. A small room is fine, just for housing sleeping boys. The air circulation in there isn’t so great but there is an enormous floor fan provided for us in there. It helped to run it at night to move the air around so the top bunk doesn’t get too hot. There are ample drawers and bureau space to put away clothes. We were here for 9 nights so it was nice to have a place to separate clean and dirty clothes. Bedroom #2: It has a king bed and a spacious wall cabinet that houses a tv and storage to put away your belongings. Bathroom has an ENORMOUS shower/vanity area. This area is open to the bedroom. There is no separating door. It is a combined wet/dry area and a separate toilet area (that is accessible if you walk through, or past, the shower/vanity area). With 7 kids (4 of whom are girls 10-14) who often are showering/getting ready together this sort of floor plan is perfect. It would also be convenient if you had someone older who needed to sit down when showering. The sink area is roomy and has plenty of space for everyone’s things. Hotel sized shampoo, conditioner, shower gel, and lotion was also provided here, so no need to bring your own. Large sizes are easily acquired downstairs. Living room has two large sofas that comfortably sit 3 adults each. A TV with both English and Spanish channels. Each sofa turns into a full sized futon, this is where we put our 4 girls. Great for those who like a hard bed. The kitchen is nice and contemporary with a 4 burner glass stove and stone countertops. The house has a pot for boiling/making stews and several frying pans which we used to make lots of eggs. It also comes with all the basic plates, cups, and a shallow bowl/plate that is rounded up on the sides (like for soup or a side salad).